In this post, we will discuss about some possible versions of the old heroes who have already taken part. We have 23 different characters: Glenn, Carol, Gabriel, Negan, Morgan, Eugene, Jesus, Michonne, Ezekiel, Jerry, Rick, Tara, Carl, Merle, Aaron, Daryl, Maggie, Sasha, Dwight, Abraham, Rosita, Rufus and Governor. We all noticed that NG recently didn't release any new character as hero but made new versions of old heroes: Rick, Glenn, Morgan and Daryl. I heard that there were something happened on the agreement between NG and actors so that it is not likely to see any deceased character soon, such as the well-expected Beth, Andrea, Shane and missing Heath. There is still some hope for the alive characters like Enid, Siddiq, Magna and Yumiko. But according to the current trend, new versions of old heroes should be the most focused point. Besides, I have to apologize for my bad bahavior in my previous post about new heroes. I should not show extreme attitudes and vicious words in the debate on the issue- "should we have new heroes?" Now I try to persuade the sceptics in warm ways. But I still stick to my idea that we should have new heroes. With the coming v3.0, we have a new mode: guild war. A new mode means the demand of new strategies and new traits. A hero is the best way to bring a good trait. So we should be enthusiastic to the appearance of heroes. We will together find out a way to unlock a hero without dilution of tokens caused by radio calls, like Aaron and the two Daryls. We can discuss to solve all conflicts of opinions. So we start a new start. Let's be active to make our game better! Let's make an analysis first. 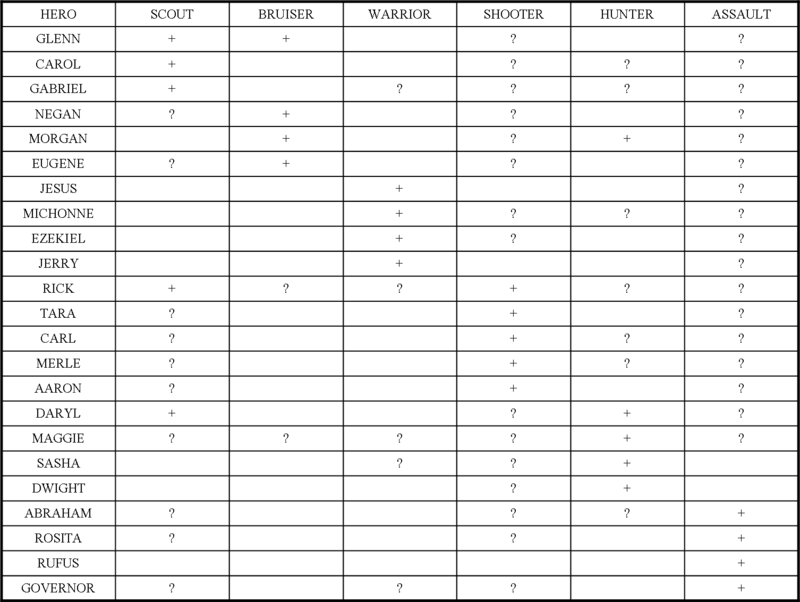 From the sheet we can see the possible classes of each heroes. The class possibility is according to the TV episodes. + means already exist, ? means maybe appear. In my estimation, these are the the heroes who may be released as a new version in the near future: Carol, Gabriel, Negan, Eugene, Michonne, Tara, Aaron, Maggie and Rosita. Carol causes 50-100% more damage with full charge points before a charged attack. Carol has 20%-100% chance to share her redundant charge points to a ramdom teammate whose are not full. As a leader, all team members gain these bonuses. Other traits: Retaliate, Marksman, Bullet Dodge, Ruthless. Eugene has 20-50% chance to dodge any attack in owerwatch without any movement, meanwhile the attack he takes has 50-100% chance to be a body shot. As a leader, Scouts, Bruisers and Warriors gain these bonuses. Other traits: Iron Skin, Lucky, Power Strike, Defensive Stance. I think new heroes with good leadership skills can be used in guild wars. but if it is possible to add new characters such as Magna, Enid, Shane, Beth, that would be cool. Bro, I even desire these heroes more than you do. Unluckily, if the informaton is true, NG didn't get the permission from AMC and the actors. What we can do is only waiting and desiring. But I am really glad to meet a enthusiast for new heroes like you. If Negan's attack fails to kill any target, he has 50-100% chance to get an extra movement point. As a leader, all team members gain this bonus. Other traits: Sure Shot, Iron Skin, Retaliate, Vigilant. I think a shooter Carol is highly likely given the new bow for shooter class and recent episodes. Ruthless, Retaliate, Revenge, Vigilant would be appropriate IMO from the episodes. Leader trait.... I think it would be cool if she had increasing chance for attacks to become incendiary even if the weapons aren’t incendiary. Just think of Lucille on fire! (Loved that scene) All guns are now flare guns! Viking funerals for all freeman! (Minus the water) This could somehow pair with hazard suit like damage resistance from fire. @Michonor23 Incendiary is indeed a good trait. I created heroes about it: Lizzie and Cyndie. But fire sometimes hurt ourselves too.What I am doing is creating heroes and their traits. Maybe they don't fit in pair. So I hope you and NG can match them more properly. If Maggie kills an enemy during enemy turns, she has 50-100% chance to get double charge points. As a leader, all team members gain this bonus. Other traits: Vigilant, Punish, Strong, Retaliate. If Rosita is out of action (stunning, stuggling or dead), teammates have 20-50% chances to make critical hits and suffer body shot. As a leader, all team members gain this bonus. Other traits: Lucky, Dodge, Defensive Stance, Power Strike. Aaron resists the first attack by 20-50% and has 20-50% chance to get a movement point after dealing a body shot. As a leader, all team members gain these bonuses. Other traits: Strong, Bullet Dodge, Iron Skin, Ruthless. Tara causes 40-100% more damage and reduces 40-100% chance of body shot on the certain target directly aimed by her. This trait doesn't work if Tara only attacks single target. As a leader, all team members gain these bonuses. Other traits: Sure Shot, Dodge, Lucky, Marksman. Michonne causes 30-60% more damage and resists 30-60% damage if she stands next to a teammate. As a leader, all team members gain these bonuses. Other traits: Ruthless, Revenge, Iron Skin, Marksman. Gabriel gets a charge point after making a human enemy seriously injured. Gabriel has 20-50% chance to interrupt any melee attack during overwatch. As a leader, Scouts, Bruisers and Warriors gain these bonuses. Other traits: Lucky, Retaliate, Dodge, Vigilant. Hello, bosses! Welcome to take a look at my ideas and consider to adapt them. I wrote a post about new characters as heroes but unfortunately nothing came true. https://forums.nextgames.com/walkingdead/discussion/30569/my-own-new-heros-unoffical/ Now I know the problem with the copyright of actors between NG and AMC. So I suggest to create new versions of old heroes as you did. You already got their portrait permission, right? Guild war is coming, so it is the time to try something new. I am willing to make any affort to improve our game. And I need your notice. Thanks! This is an amazing thread, and I like some of these ideas very much! We will definitely be making more second Hero versions, and this is a great start to any brainstorming we will be doing with those characters in the future. Super big kudos for this thread and all of your hard work! Hey, I love brainstorming about new leaders and traits as much as the next person, but I would like to point out that 2 of the new heroes (Rick and Daryl) are scouts and then you suggest 3 new scouts. Also, I just want to say I always thought Carol should've been an assault, like when she stormed Terminus. However, I can totally get behind a long haired shooter Carol with a bow. @Shteevie Thank you for your attention! Due to the coming Season 9B, could you please soon consider to develop the Archer Carol? She is always a significant and powerful character but has never been the seasonal token reward. And I discussed about my idea of her trait with Chinese players. Many of them are look forward to it. Besides, we want a proper hero to operate the Super Legendary Winter Bow. Our previous shooter heroes all cannot use a bow. According to the TV episodes, Carol, Dwight and Yumiko are the best selections. But Dwight now is out, and Yumiko is not impressive as Magna. So the conclusion is that, Carol will be the most popular archer. I hope you can agree with me. Alpha is a scout. I know you know how passionate I am about her as a character and the One With The Herd hero trait (which was about halfway introduced by this update). Please be aware that extracting data or images from the game files is a direct violation of the Terms of Service, which may be punishable by the termination of your account. Please think carefully before posting such information again. @Artminius I saw the trait you designed by her. It will be activated by chance or degree? With the promotion, how will it be stronger? @Shteevie Sorry, now I know my mistake. It won't happen again. - Savior Eugene (Assault) w/ Lead Skill "Side Switcher", idk what itd be, maybe like a chance to not get attacked by Humans for 1-2 turns? - Soldier Gabriel (Hunter); Maybe utilizes walker guts for something? Kinda like a Huntsman Daryl but for ranged characters? And then the rest are just the usual new faces but after learning about the actor ordeal: Shane, Andrea, Beth, etc. So I like the idea of an Assault Negan, but what if he held his machine gun in one hand (raised up in the air), and his bat at his side, which could be utilized in some way. After all, other characters have used guns slanted over their weapons (Morgan). Second idea, a version of Meryl that lets him use his knife hand, i mean cmon, who doesnt wanna see that thing in action? ?